The buffer beams are now at Bridgnorth after slotting and drilling, together with the stiffeners for the draw gear (these fit behind the central slot in the buffer beam) and the liners for the front and rear lifting holes (provided in the main frames for lifting the engine by crane). Members Phil and Dave Harvey have made and fitted seven temporary adjustable frame stiffeners to hold the main frames rigid and enable us to ensure that they are accurately spaced before we start to fit the stretchers. Tony has placed an order with the SVR for steel (channel section, angle section and flat strip) for stiffening of various components, e.g. horizontal stretchers and buffer beams, as well as bunker support. We are awaiting a quote for radially-bent horizontal frame stretchers from Accurate Section Bending of Wordsley (Stourbridge). An order will be placed, subject to cost, as soon as we have this. With his spectacular driving wheel pattern all but complete, Brian Oldford is now starting to turn his attention to his next project, the pattern for the firebox support bracket. This is another major item of the loco's frame stretching components, and will enable us to make significant progress towards the achievement of a complete frame assembly. 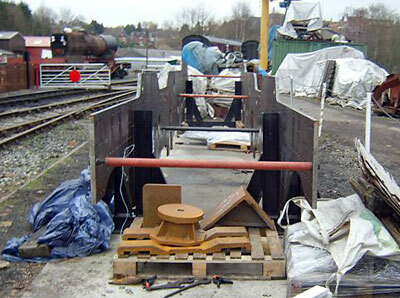 Arrangements are being made for the Fund's two pairs of buffers to be transported to the SVR over the next few weeks for refurbishment as a volunteer project at Bridgnorth. Tony and Chris had a very constructive meeting on 29th January, as a result of which the Fund is to be constituted as a company limited by guarantee and a charity. The process will take a few months to be completed, but it is hoped that our new status will be achieved by the middle of the year. The 82045 assembly site was visited by a substantial number of representatives of the HRA on the morning of 1st February. Chris gave them an informal summary of the Fund's history and objectives. 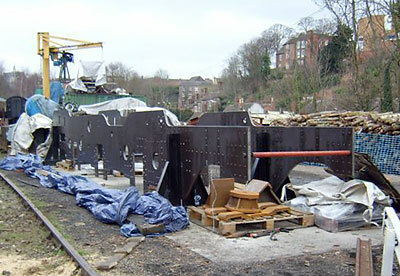 Latest photos from Bridgnorth showing temporary adjustable tie bars fitted. These will permit fine adjustment of the correct spacing between the frame plates to assist with machining stretchers to the correct tolerances. Also visible nearest the camera are pallets of castings and further away a pallet containing the buffer beams. Brian's complete driving wheel pattern was moved from Bridgnorth to its new temporary home in the Engine House at Highley on Sunday 15th February. The pattern will go on public display until the time comes for its trip to the casting foundry, and it is hoped that this superb piece of workmanship will inspire visitors to the Engine House to support the 82045 project. In the meantime, its temporary transfer to Highley has freed up much-needed space in the Pattern Shop, enabling Brian to give his full attention to his next project once a joinery job for Bridgnorth Booking Office is completed in a week or so. 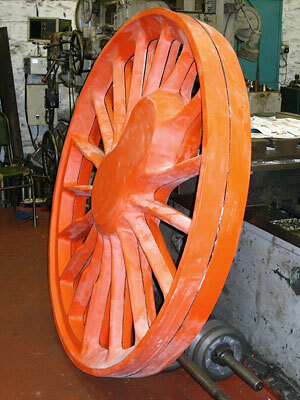 This will be the pattern for the firebox support bracket, a major part of the loco's frame stretcher assemblies.